THE MORE SERVICE THE BETTER. Service is a key role in the Valley Heights FCCLA Chapter, this past week was National FCCLA week. Members took part in various activities, a meeting was held prior to the week of service where members signed up for different activities to participate in during the week. 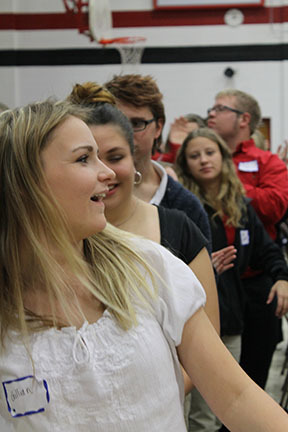 ”FCCLA Week is a great opportunity for us as members to show our appreciation to all the people who help us throughout the year.” said Makenzie Joseph, Fr. Monday was FCCLA Promo Day, Kate Wannamaker and Shae Murk, Soph. put suckers on all the FCCLA members lockers, Career in Action took place on Tuesday. Gillian Zidek Jr. made brownies for teachers and staff on Wednesday for Say Thanks. On Thursday FCCLA members took part in Make an Impact. Friday concluded the week with members wearing their FCCLA t-shirts. “ I really enjoy FCCLA and all that we do, it's just a good organization to be in.” said Hanna Yoder Jr.